We have established ourselves as coveted organization, involved in manufacturing and exporting a broad gamut of Automobile Accessories. These accessories are widely appreciated for their durability and resistance against heat. In addition to these, we are instrumental in offering the product range which is acknowledged for its excellent finishing and dimensional stability. All our products are manufactured using optimum grade raw material, which we procure from trusted vendors of the market. Designed utilizing the latest technology, our company offers a wide range of Silicone Steering Wheel Cover. These products are suitable for their applications in various commercial automobiles. Known for its features of light weighted, durability and cost efficiency, it is high in demand among our customers. 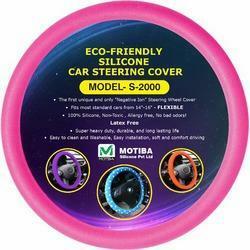 With the valuable assistance of skilled team of professionals, we are engaged in offering an extensive range of high quality Car Steering Cover. Looking for Silicon Automobile Accessories ?